Moving on, we passed through the Tiananmen Gate to reach the Forbidden City. 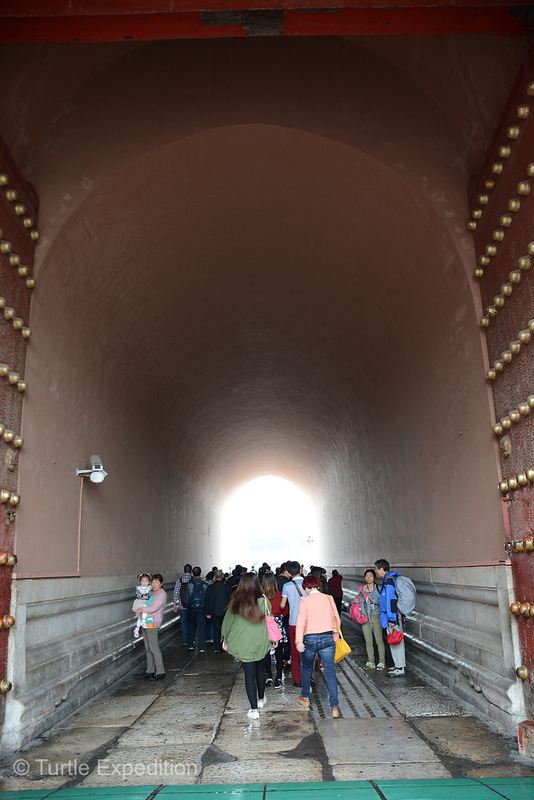 There are five massive doors to the gate and seven bridges spanning moats or streams. 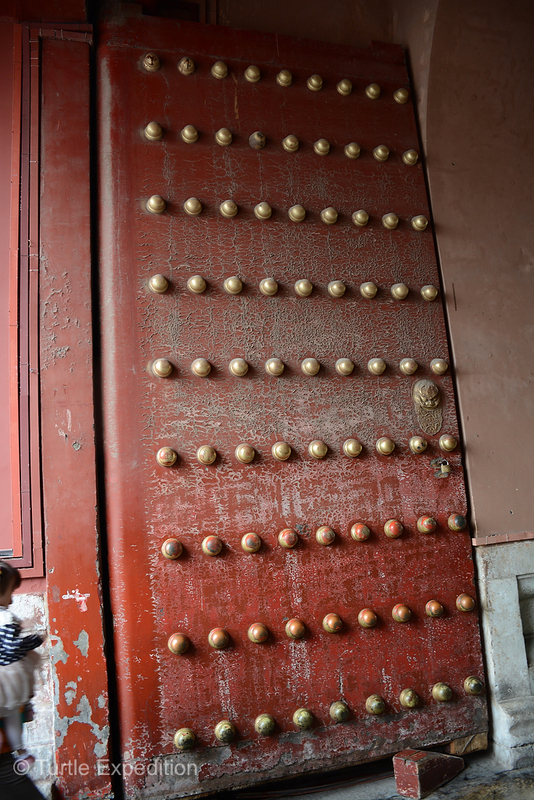 It was from this Gate on October 1, 1949 that Mao Zedong proclaimed the People’s Republic China. 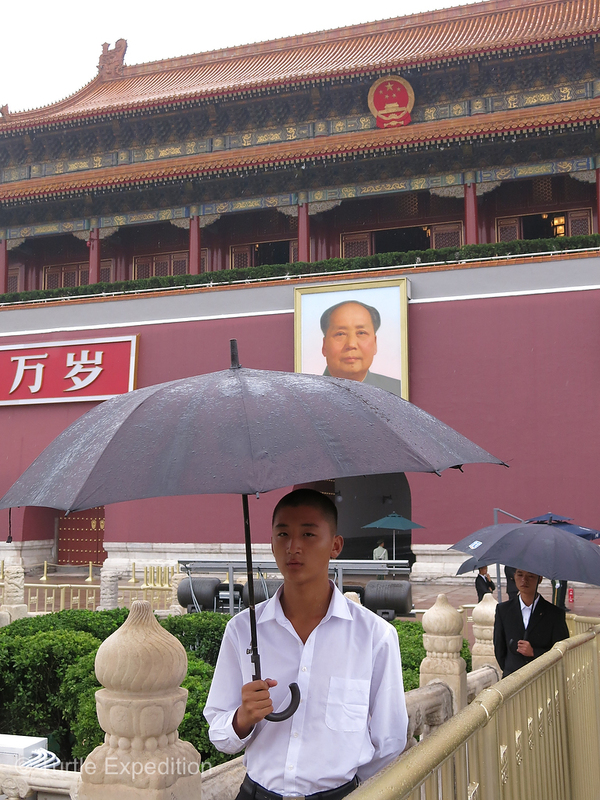 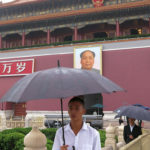 The dominating portrait of Mao is a must photo background opportunity for Chinese selfies. 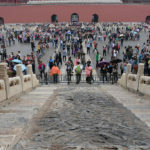 The largest stone carving in the palace, it is 16.75 meters, (60 ft), long, 3.07 meters, (12 ft), wide, and 1,7 meters, (5.5 ft), thick. 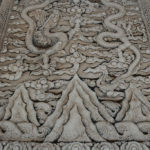 It has beautiful interlocking lotus patterns, curling waves and nine dragons. 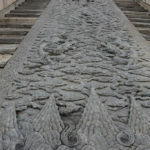 It was transported from the quarry 36 km, (22 miles), away by sprinkling water on the road to make an “ice road”. 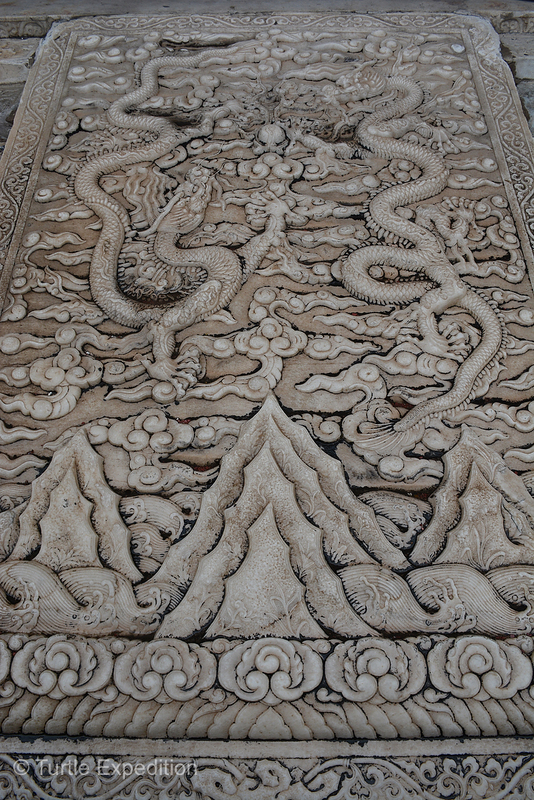 It was then pulled and slid all the way to the palace where it was carved. 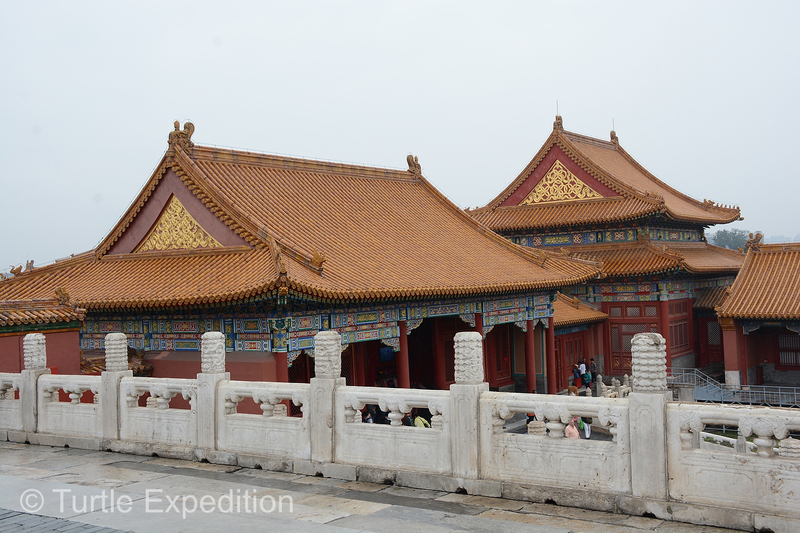 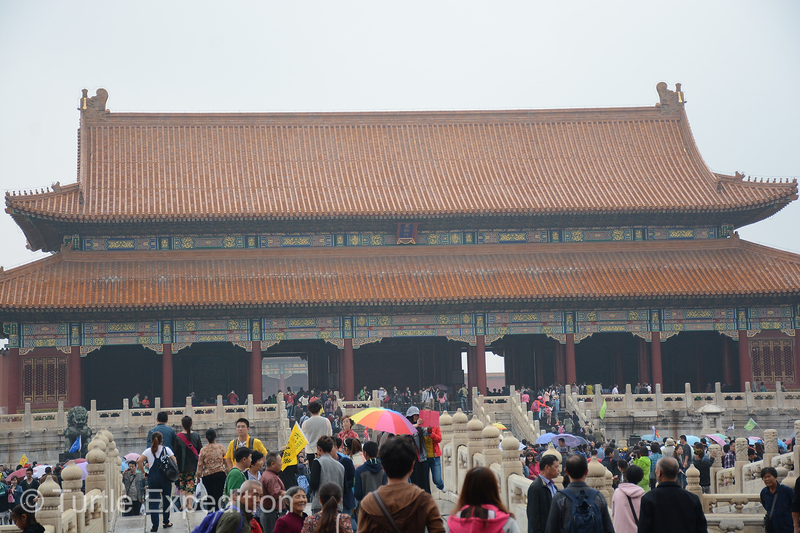 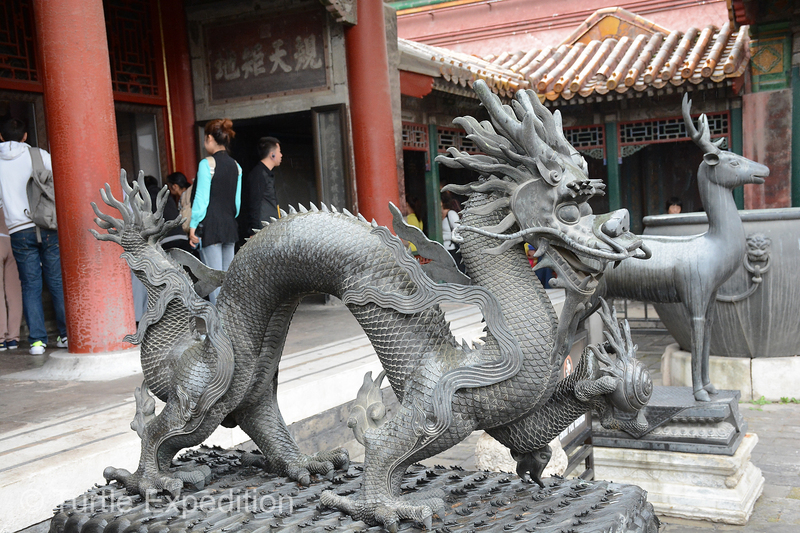 The Forbidden City is the former Chinese Imperial Palace from the Ming and Qing dynasties (1420-1912). 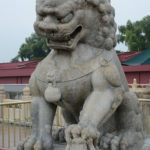 It covers 178 acres. 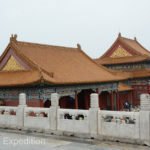 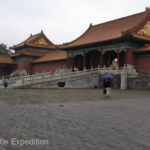 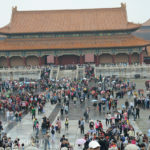 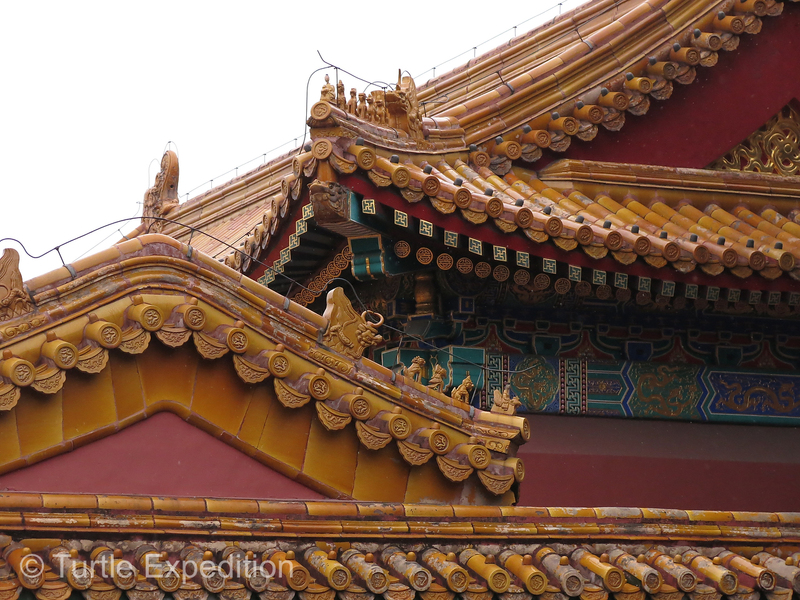 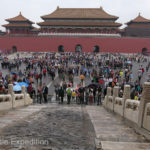 It’s called The Forbidden City because during those dynasties, when it was home to 24 different emperors and their households who ruled all of China for almost 500 years, ordinary people were not allowed in without special permission. 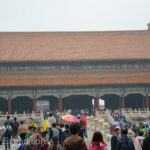 The main palace took 20 years and one million workers to finish. 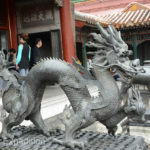 On a side note: In 1215, Zhongdu, the capital of the Jurchen Jin dynasty located in todays Beijing, was destroyed by Genghis Khan, the Mongol ruler. 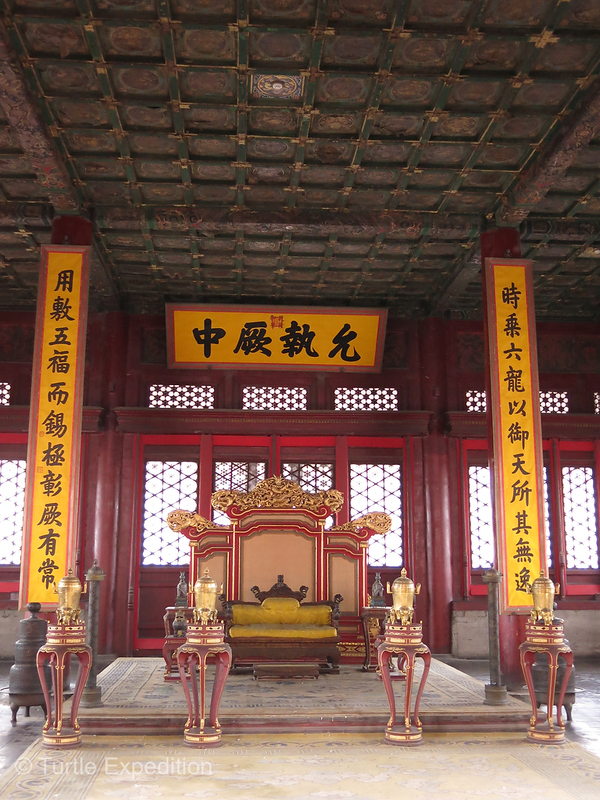 In 1271, a year after his grandson, Kublai Khan, established the Yuan Dynasty that ruled over present-day Mongolia, China, Korea and some adjacent areas, he presumed the role of Emperor of China, the first non-Han emperor to conquer all of China. 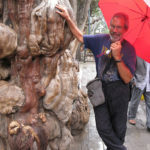 He built his new winter capital in another section of Beijing. 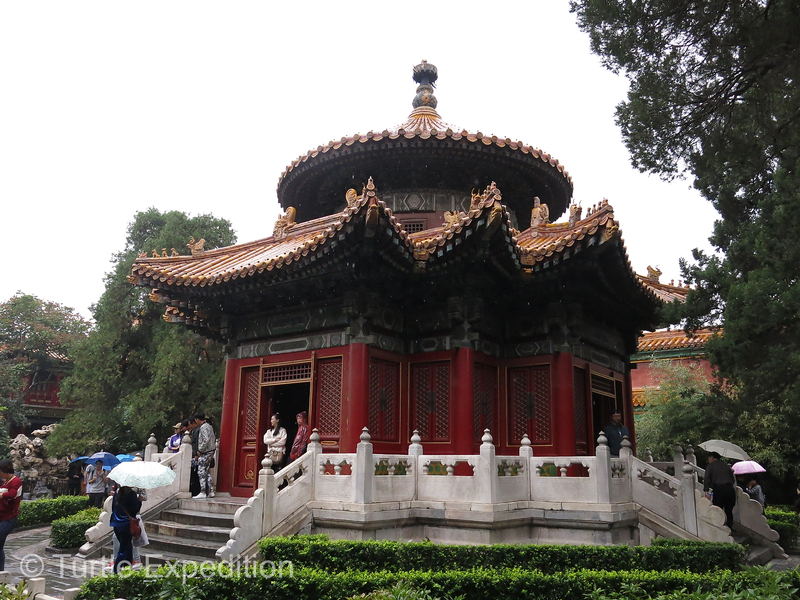 Marco Polo and his dad & uncle left Venice (Italy) the same year to travel to China along the Silk Road (much of which we followed). 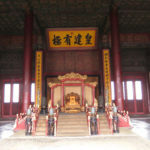 Three and a half years later, Kublai Khan invited them to his palace where they lived for 24 years before returning home. 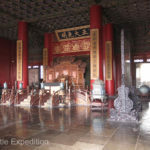 Marco Polo called the capital “Cambulac” but because Kublai Khan encouraged diversity in his vast empire of many different languages and religions, the capital was also called Khanbalik or Dadu. 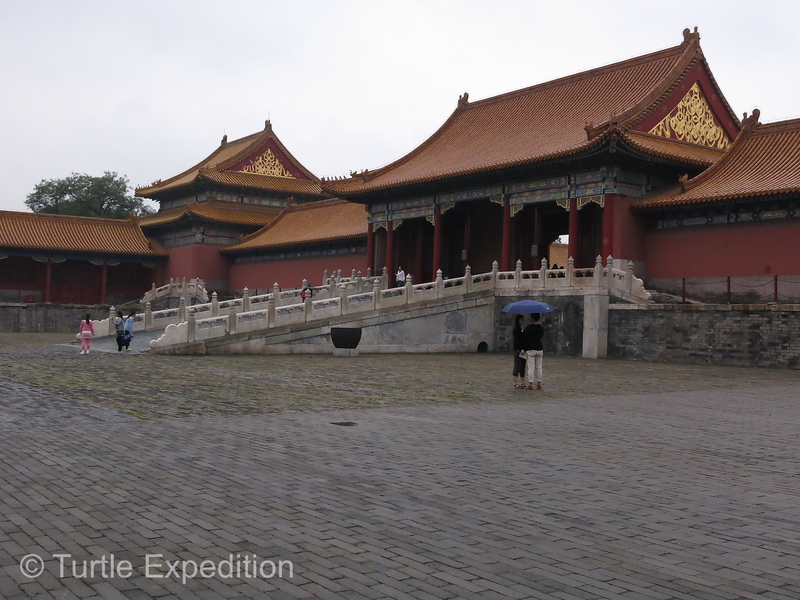 In 1368, Camulac was destroyed by an emperor of the Ming Dynasty though The Forbidden City was not built until 1420. 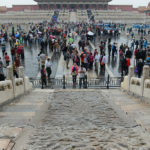 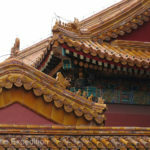 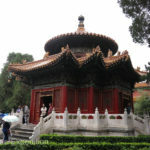 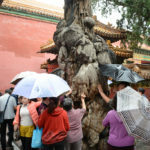 The Forbidden City has been transformed into the “Palace Museum”, quite literally a museum of palaces and special halls, and it is open to the public. 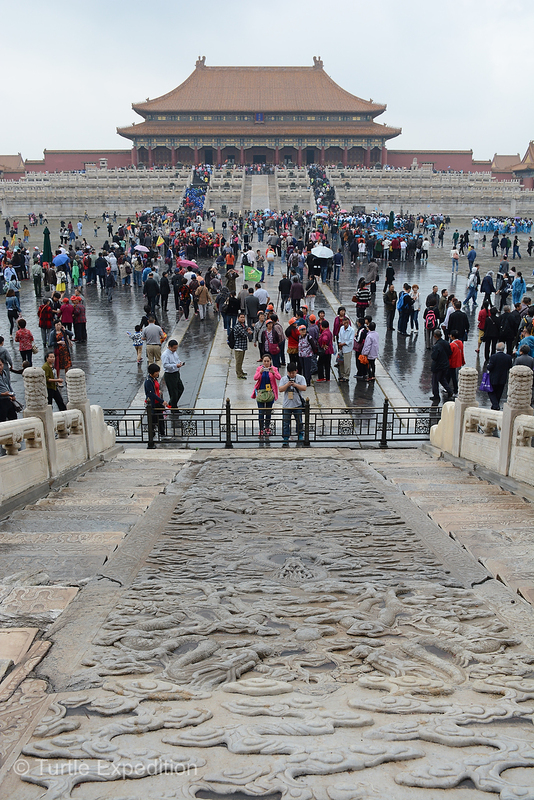 Some 14 million visit it annually. 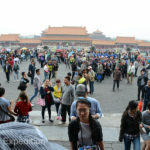 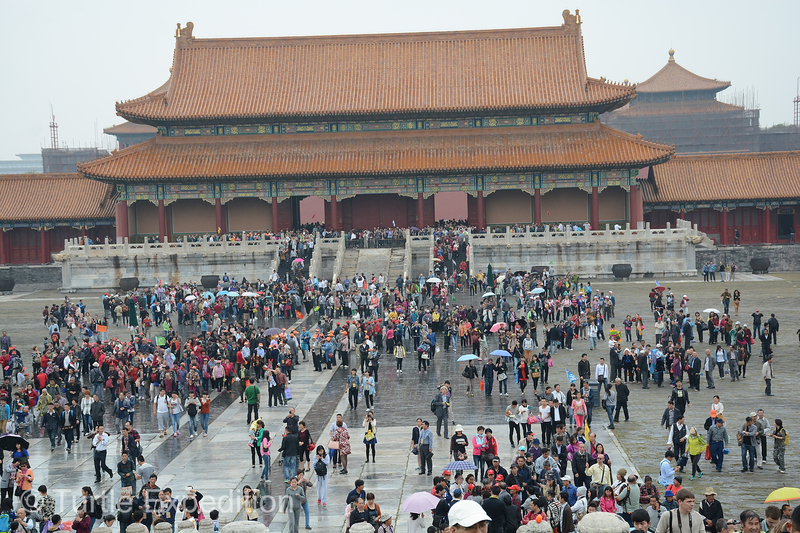 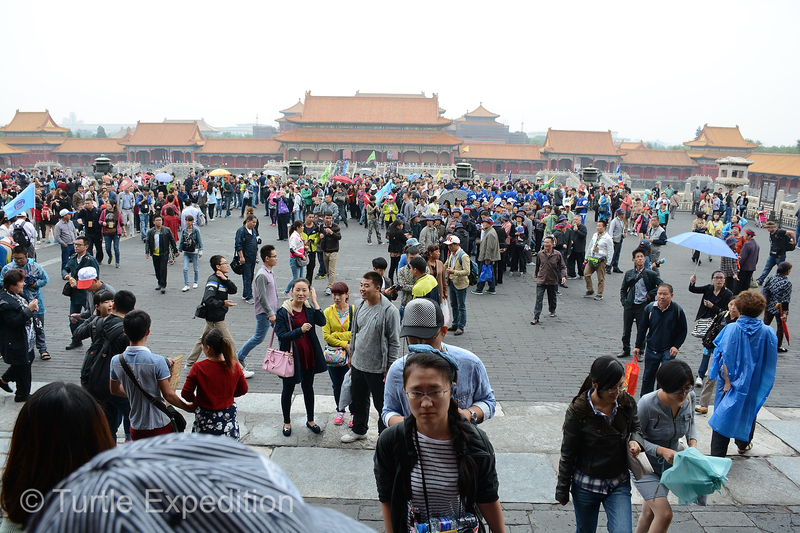 It is the world’s largest palace complex, consisting of many buildings with a rumored original 9,999 rooms. 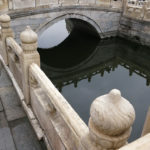 It is protected by a 20-ft deep and 171-ft wide moat, and a 26-ft high wall. 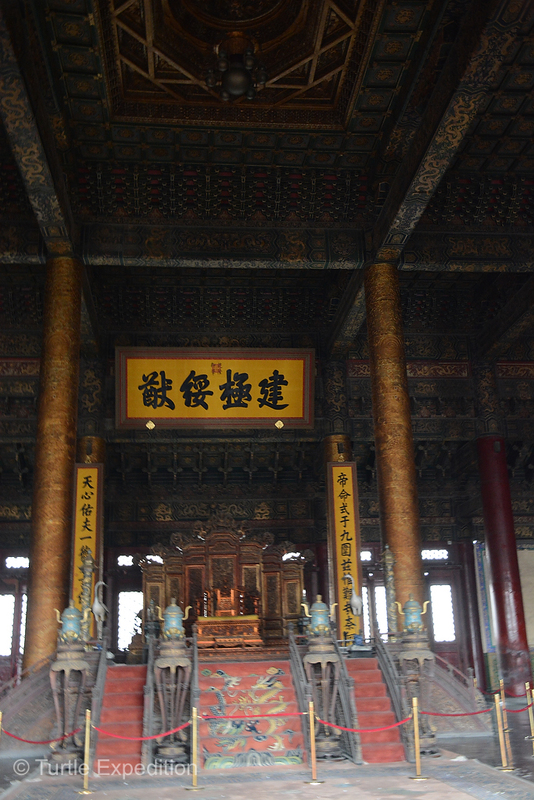 Most of the palace rooms can only be seen from the outside. 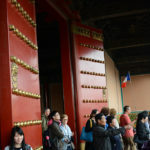 Without walking with our nose in a guidebook, we were impressed by the excess of beautiful carvings, paintings and gold surrounding thrones having been used by the ruling emperors and their princesses. 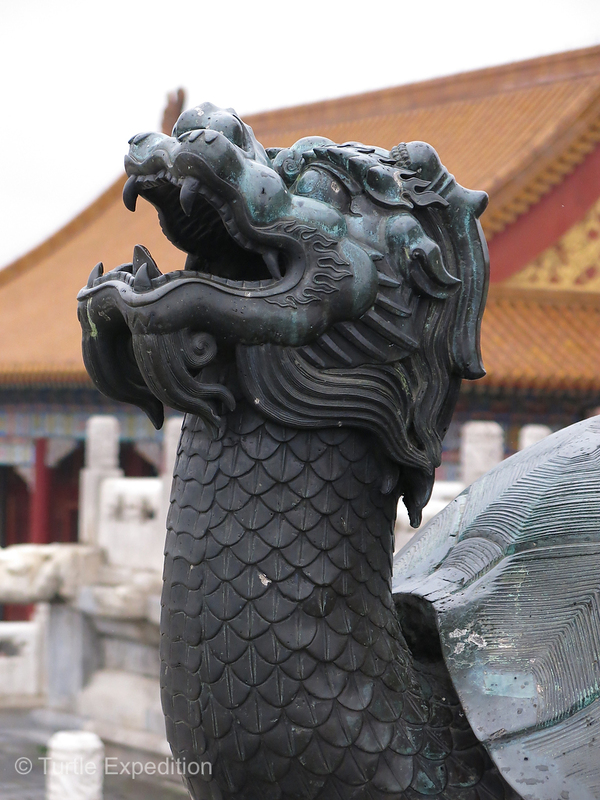 The numerous cast figures of dragons, lions and monster turtles were intriguing. 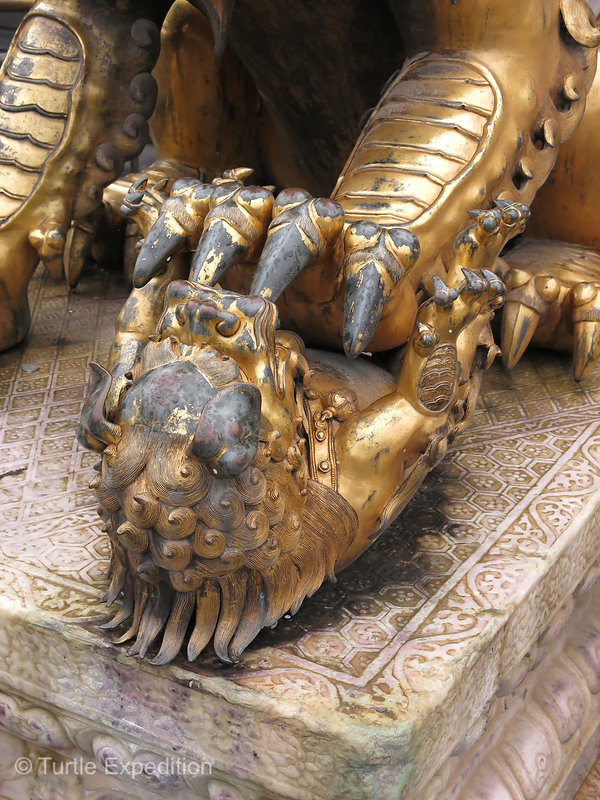 Their purpose was to guard against fire and evil spirits. 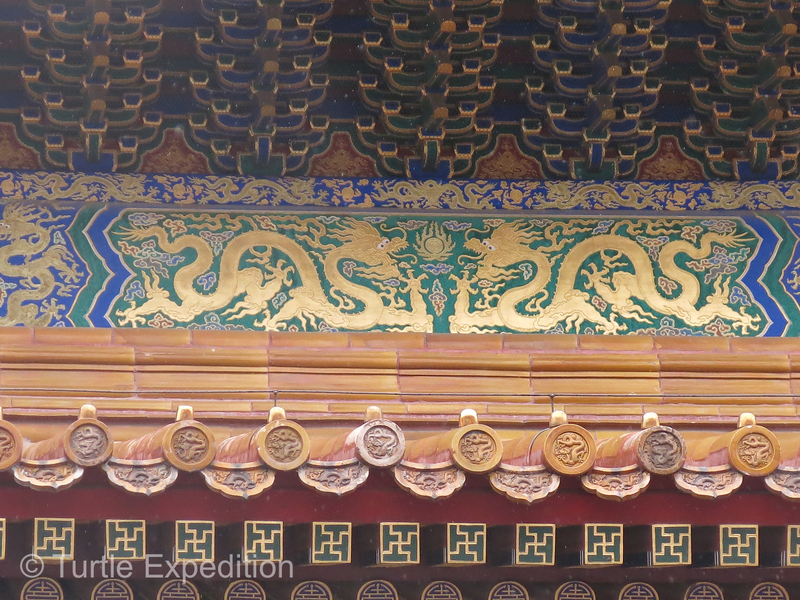 The architecture was amazing, with each detail having a symbolic meaning. 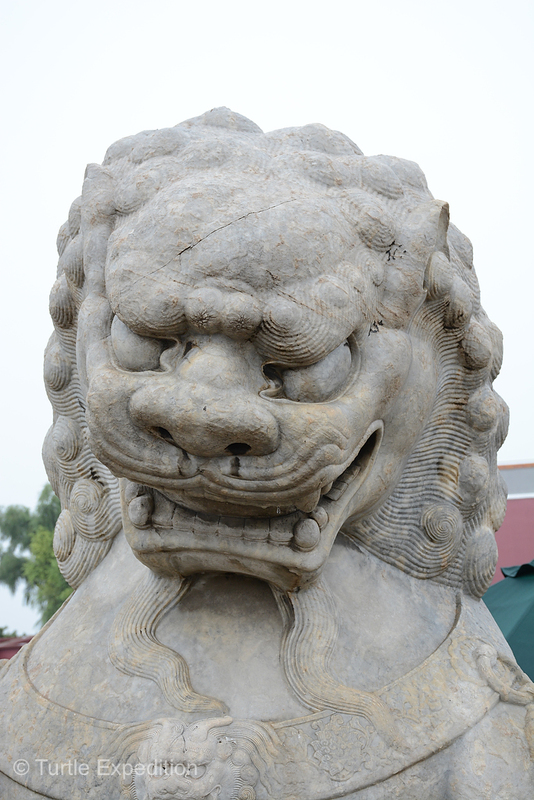 The best we can do is show you what caught our eye. 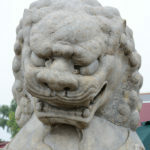 Captions will give some details. 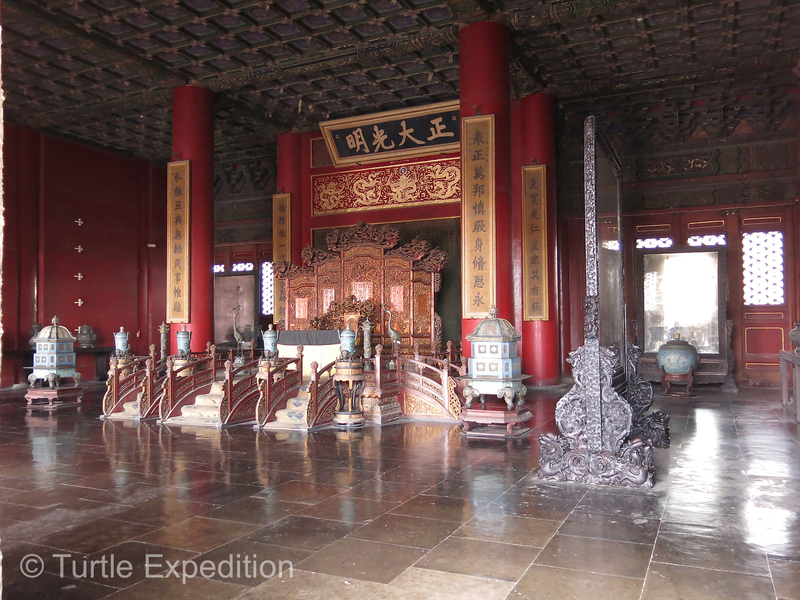 After spending much of the day wandering from one palace or hall to another, we were ready for a late lunch. 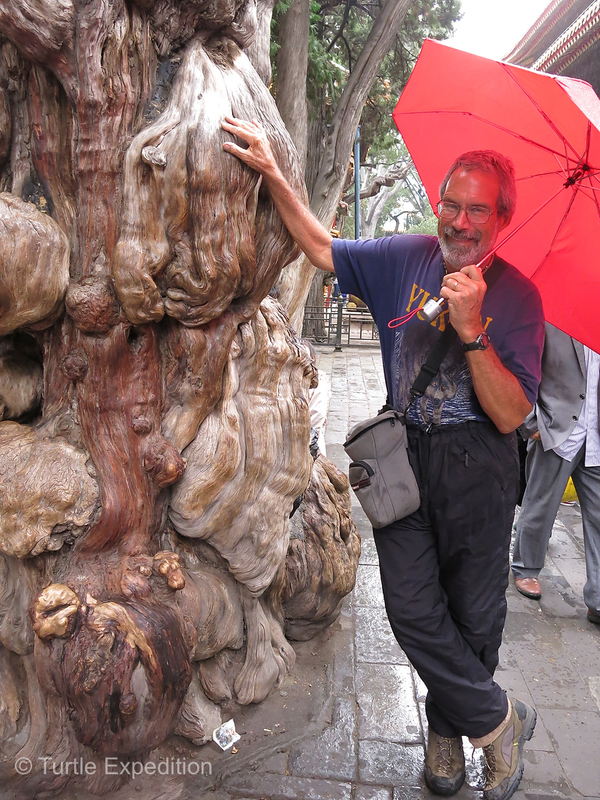 Green, our wonderful guide, spotted the perfect greasy spoon. Nearby we found an entry into a neighborhood called a Hutong, a special part of Beijing we wanted to visit. 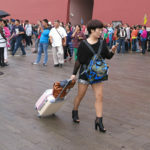 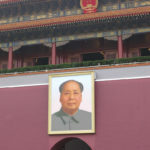 See more on Beijing Part 3 (China # 24). 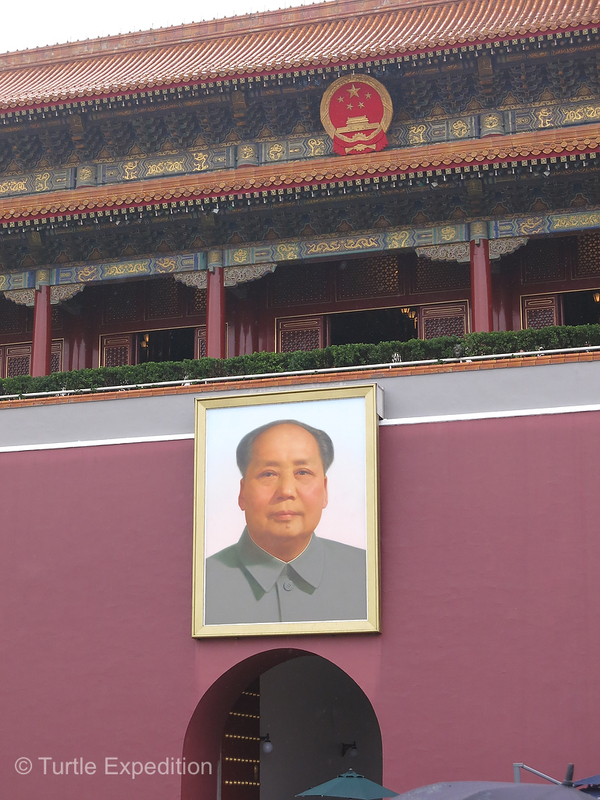 The large portrait of Mao is a must photo background opportunity for Chinese selfies. 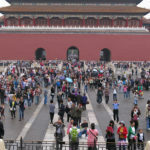 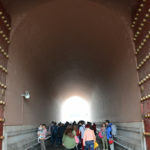 There are five massive doors to the “Gate” opening to Tiananmen Square. 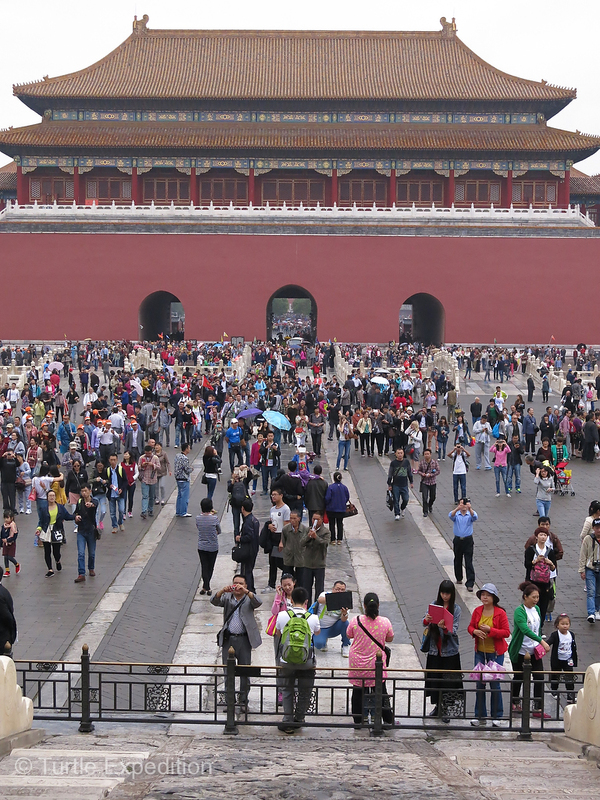 It was from the Gate on October 1st, 1949 that Mao Zedong proclaimed the People’s Republic China. 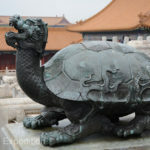 At that time there were no trade wars on the Silk Road. 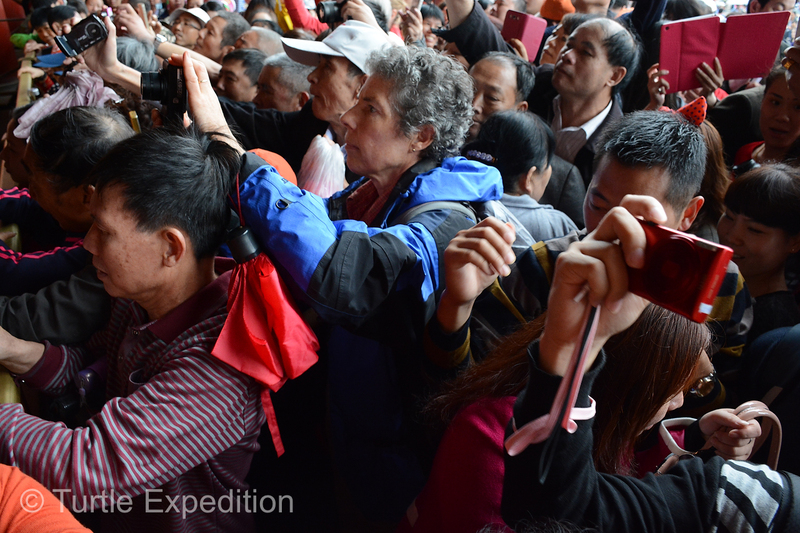 The cross section of the Chinese population was interesting. 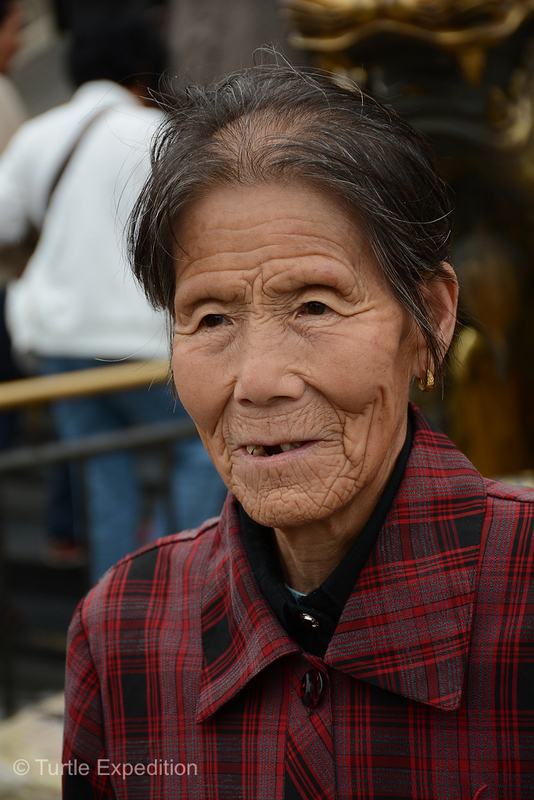 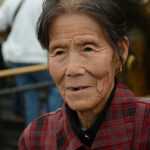 The young and the old, there are 56 recognized ethnic groups in China. 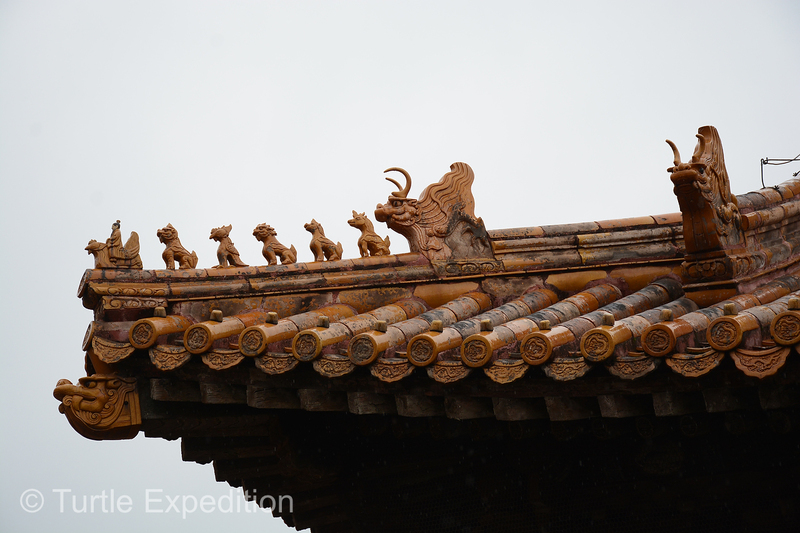 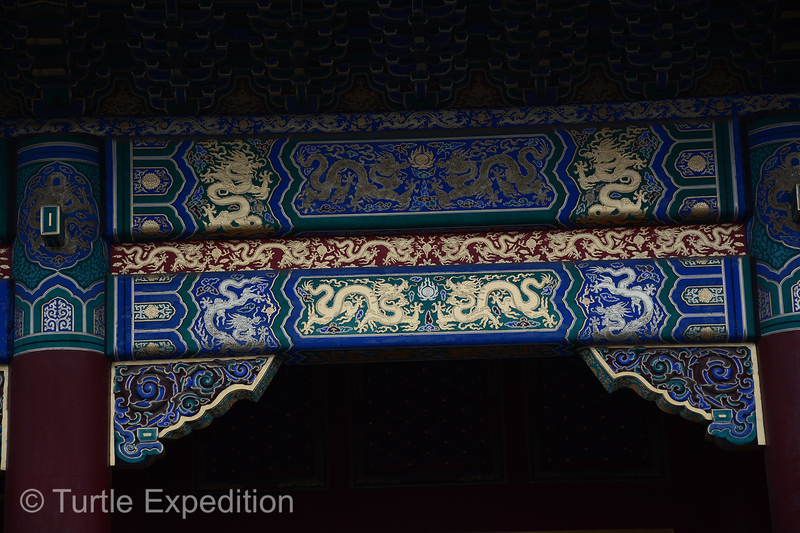 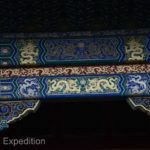 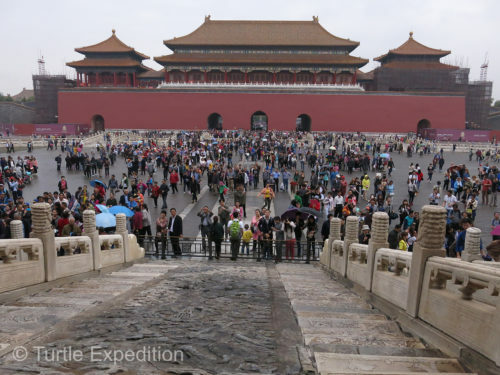 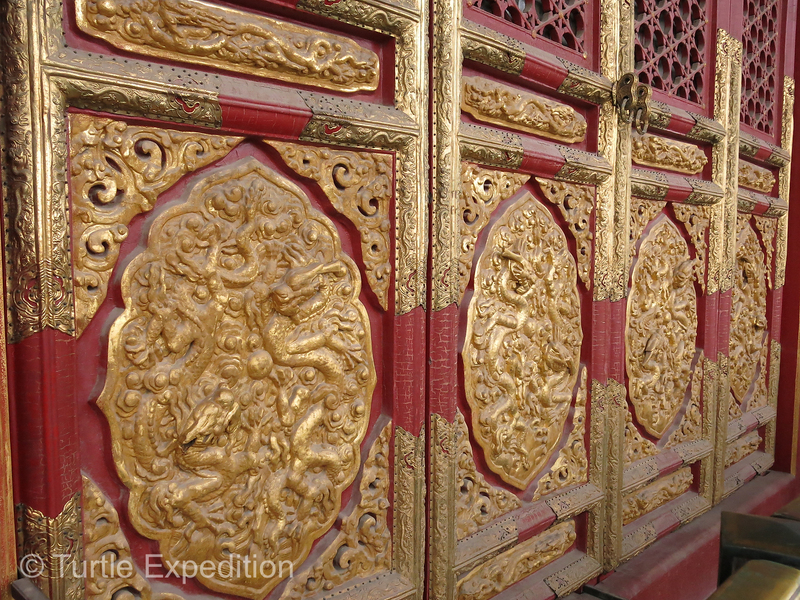 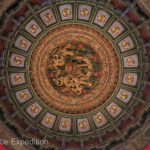 Their dream of visiting the Forbidden City once in their lifetime had been fulfilled. 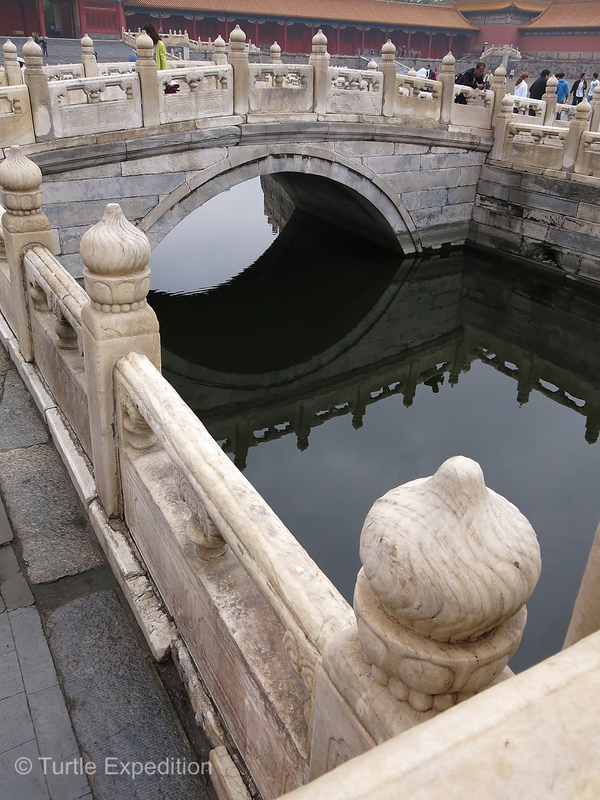 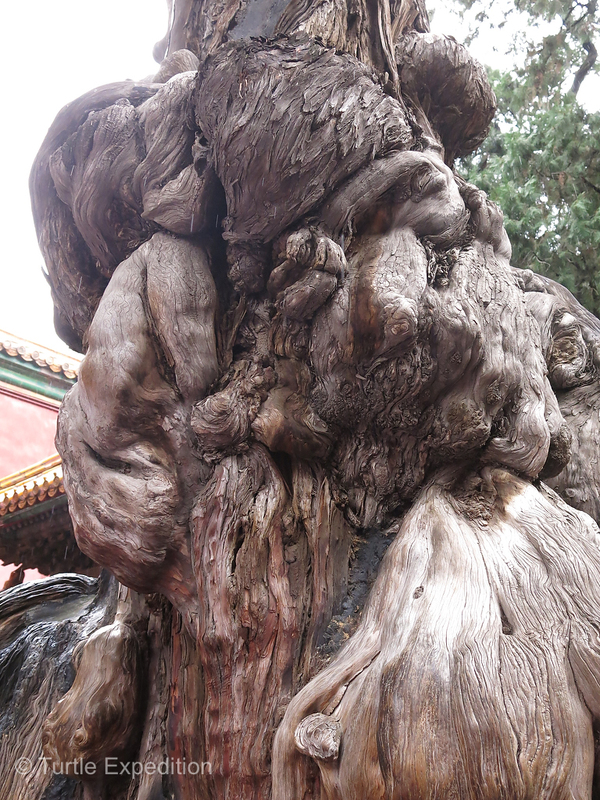 There was a large moat and manmade streams inside the Forbidden City. 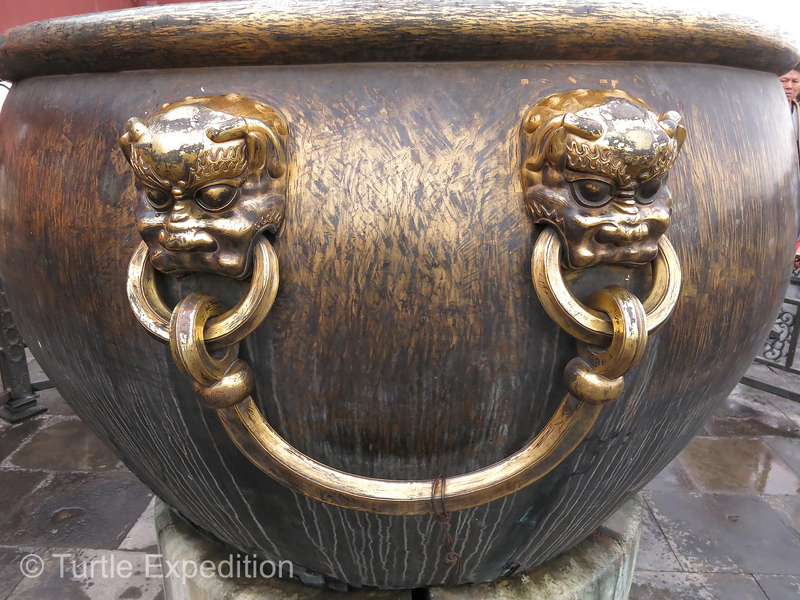 This strange vessel was designed during the Han Dynasty. 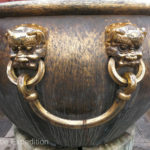 Cast out of bronze and plated with gold, it was the official way of measuring grain. 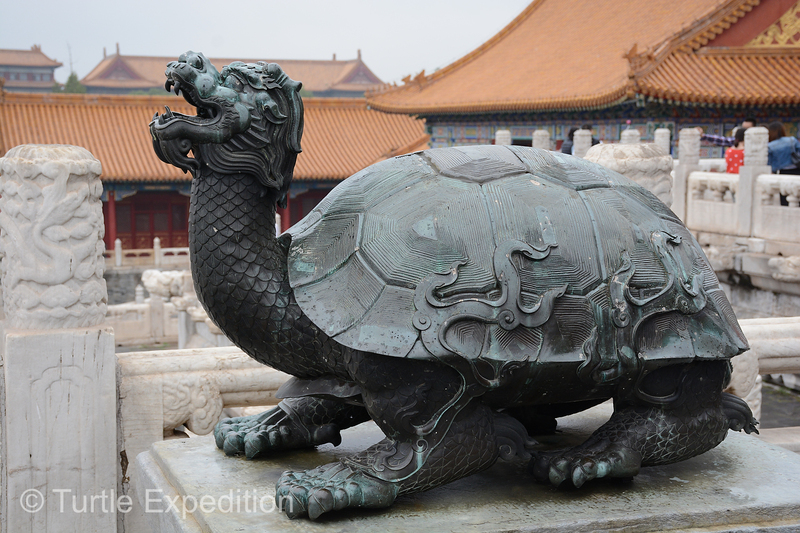 This mean looking turtle was one of many used guards against fire and evil spirits. 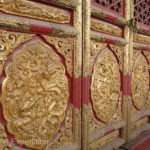 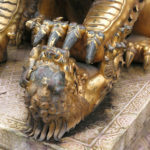 Two gilded lions were in front of the Hall of Mental Cultivation. 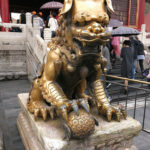 One was playing with a ball and the other, (look closely), was playing with a baby lion cub. 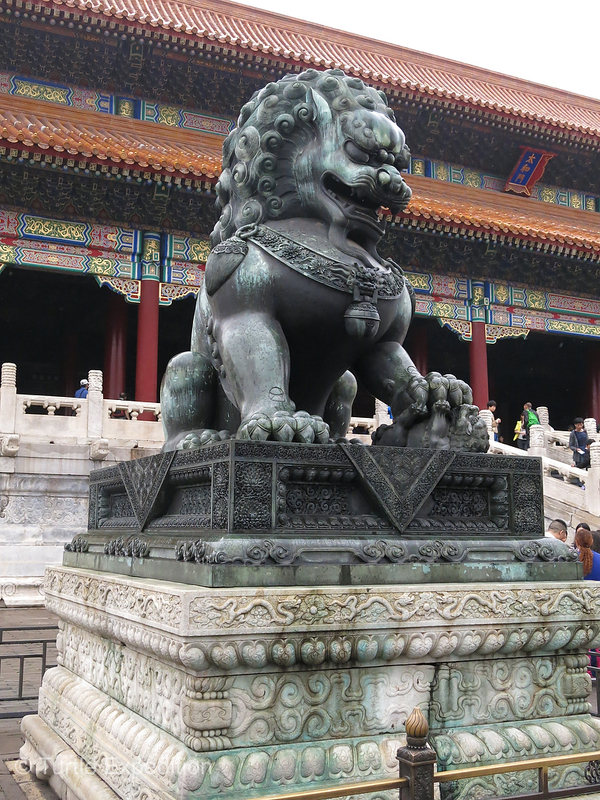 They were created in 1412. 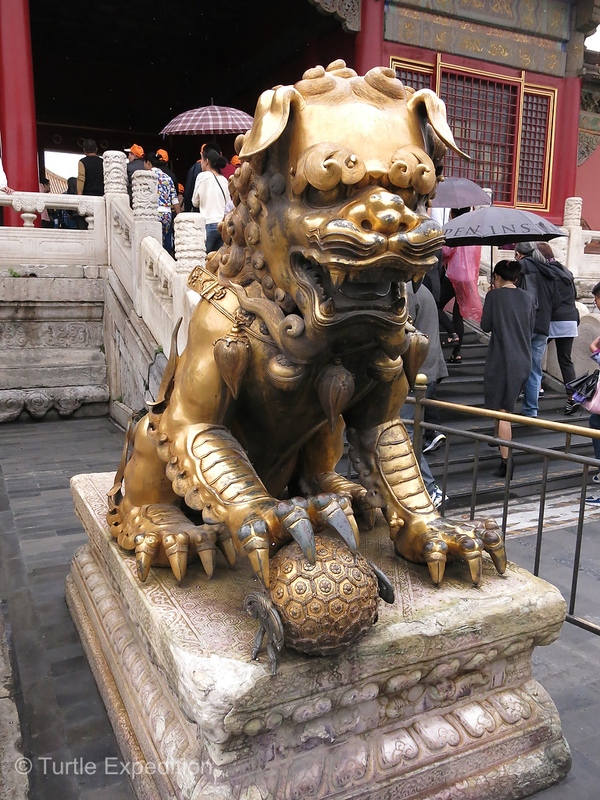 There were several of these intricately sculptured lions in the City. 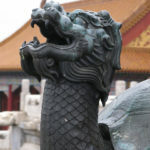 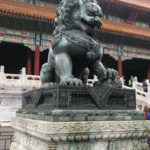 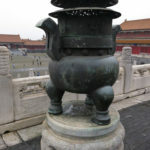 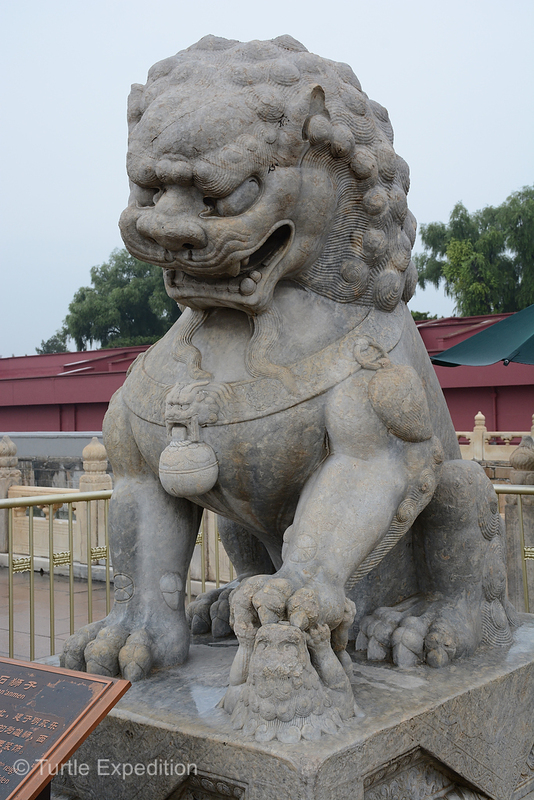 Since the introduction of the lion symbolism from Indian culture, especially through Buddhist symbolism, statues of guardian lions have traditionally stood in front of Chinese Imperial palaces. 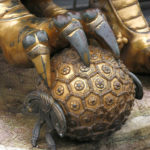 Pure art. 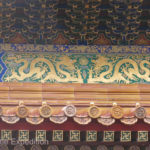 There was not a plaque with more information. 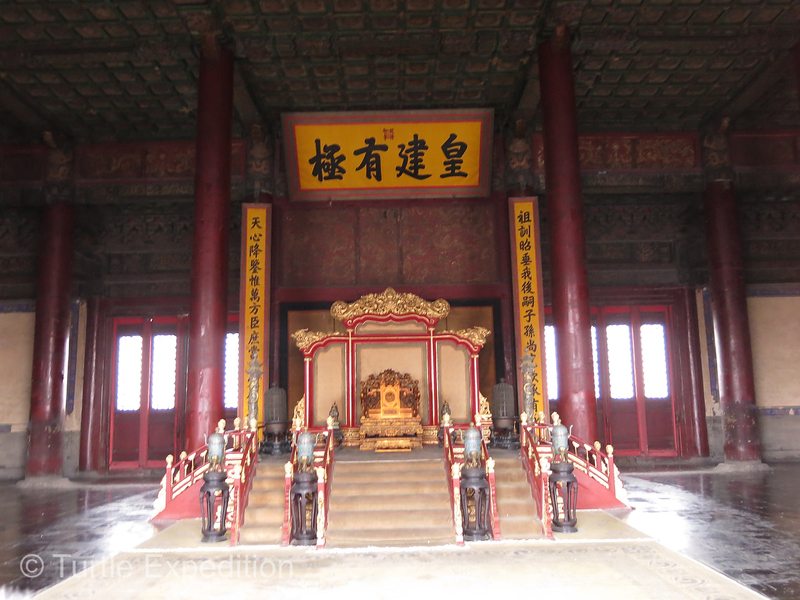 We were impressed by the excess of beautiful carvings, paintings and gold surrounding thrones that were used by the ruling emperors and their princesses. 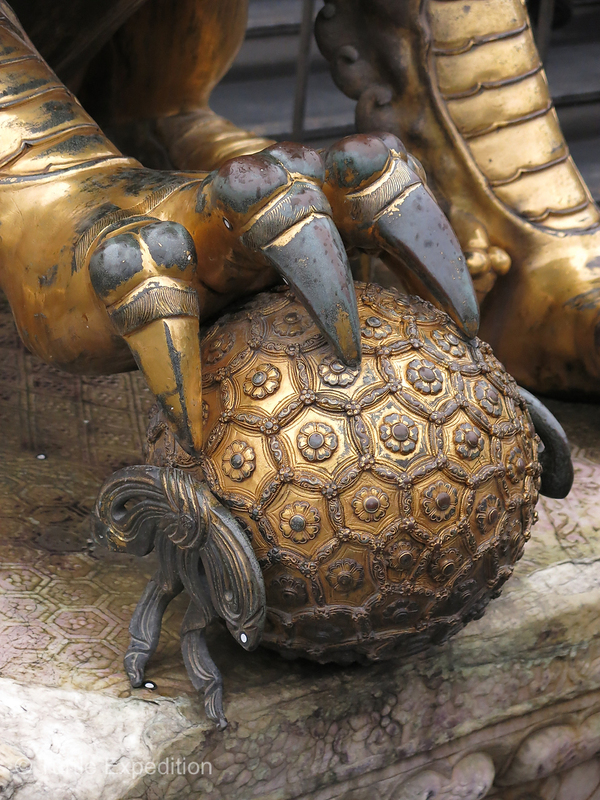 Each detail had a symbolic meaning. 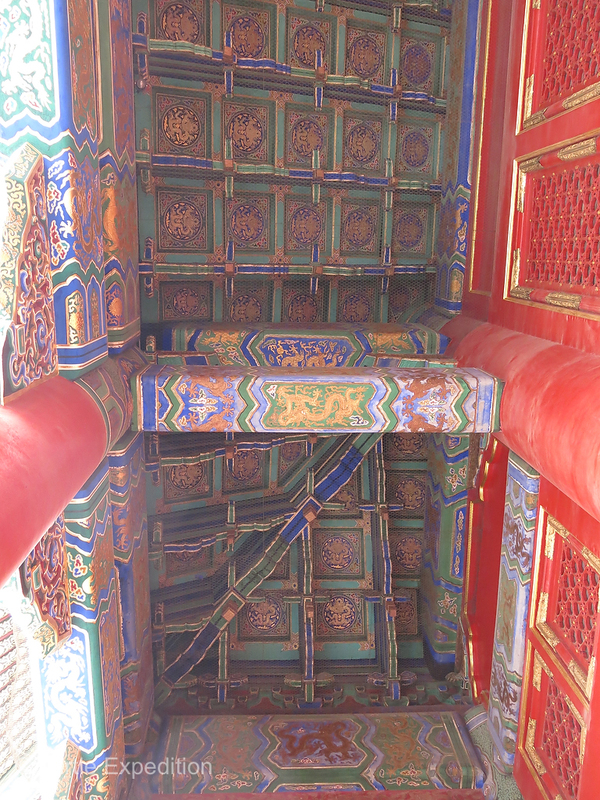 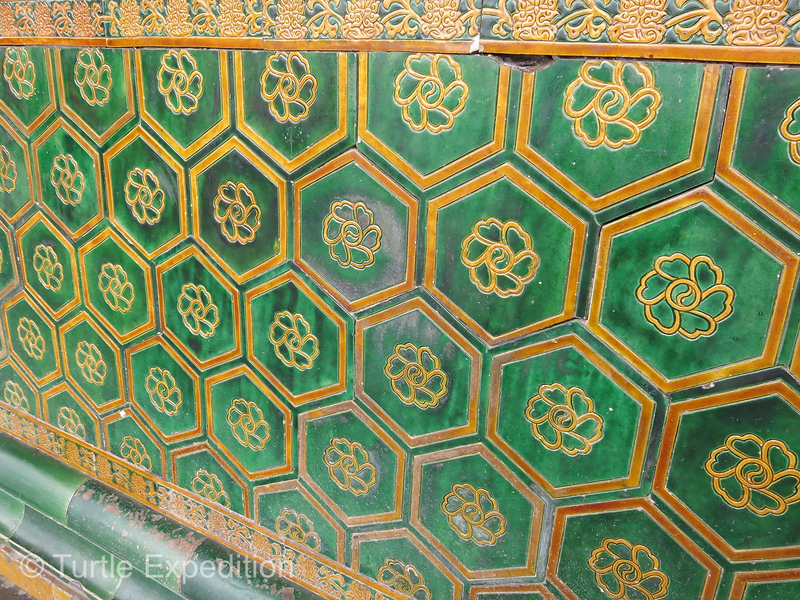 The ceilings of some of the palaces were exquisite. 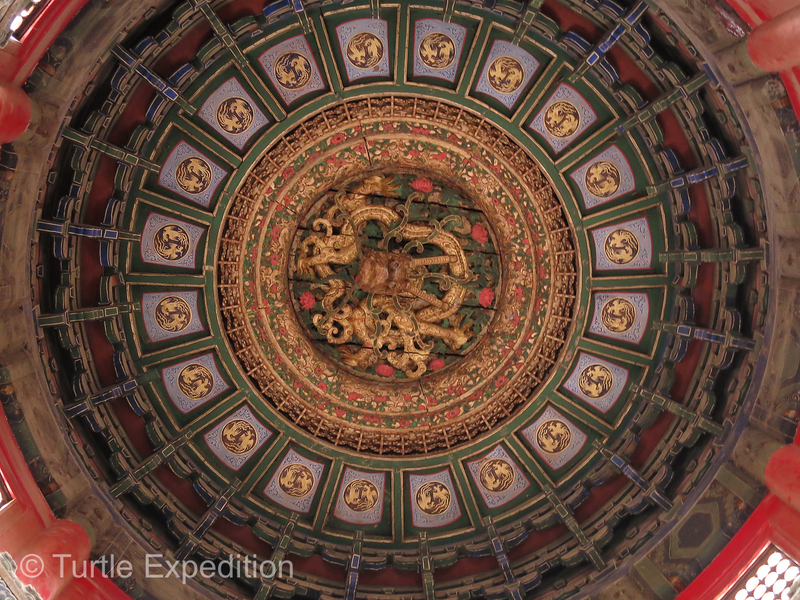 This cupola was a master piece. 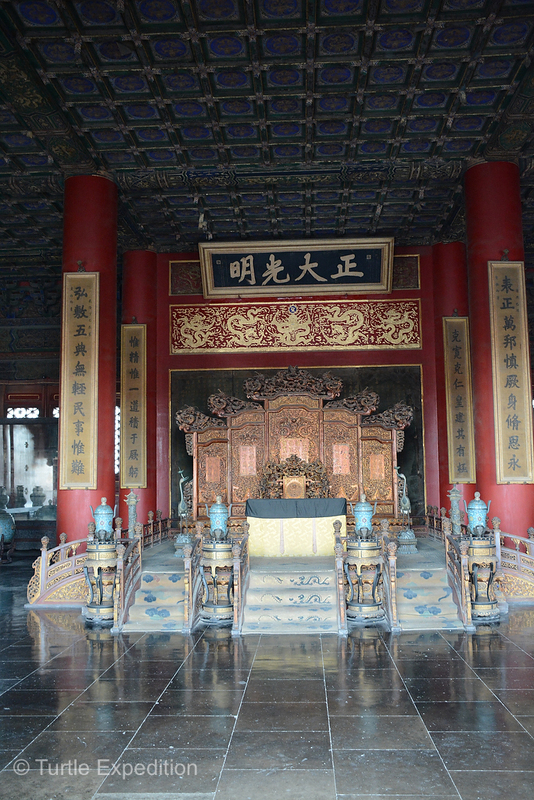 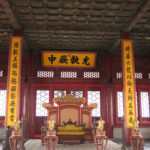 Built in 1420, the eighteenth year of the reign of Emperor Yongle (1403-1424) of the Ming Dynasty, the Hall of Central Harmony was named “Huagaidian”. 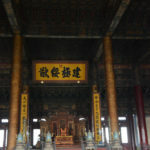 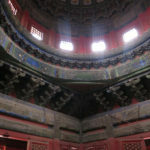 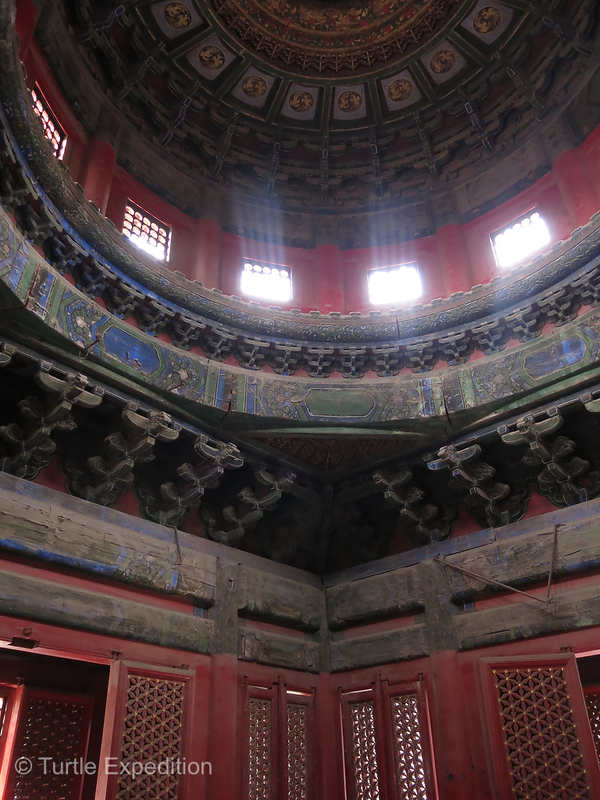 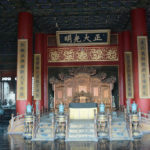 There were several special “Halls”: Hall of Central Harmony, (ZHONG HE DIAN), Hall of preserved Harmony, (BAO HE DIAN), Palace of heavenly Purity, Hall of Union and Peace, (JIAO TAI DIAN) and others. 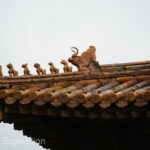 The architecture of the many buildings was impressive, often decorated with figures to guard against fire and evil spirits. 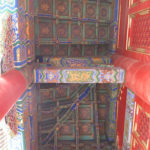 There are four gardens in the Palace Museum. 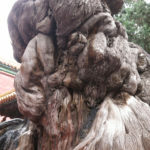 This unique tree could have been a cypress, perhaps hundreds of years old. 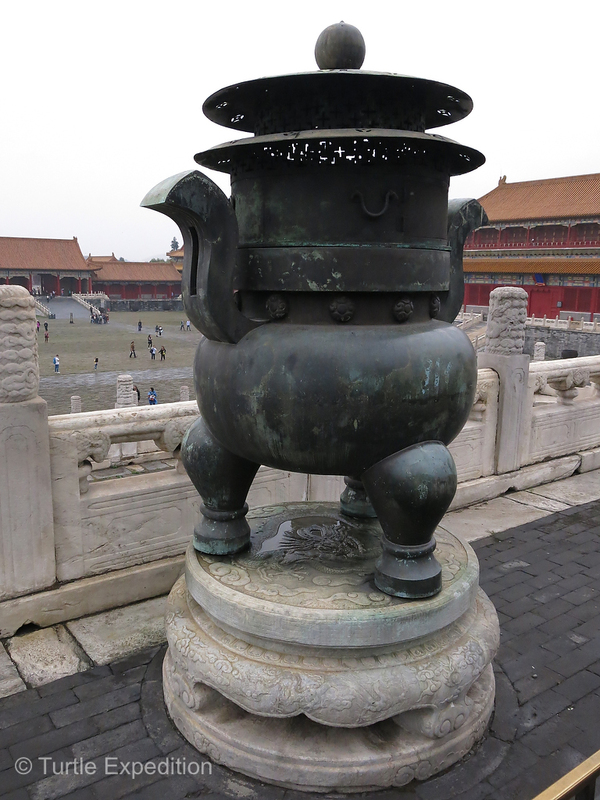 Maybe it brought good luck to touch it. 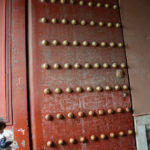 Why take a chance? 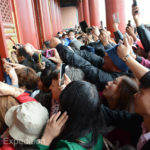 As the crowds increased taking photos of anything but people became more difficult. 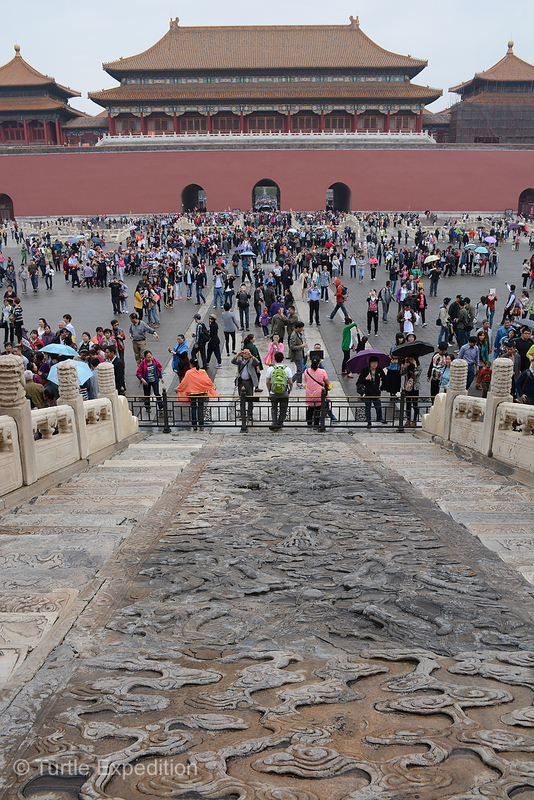 The largest stone carving in the palace, it is 16.75 meters, (60 ft), long, 3.07 meters, (12 ft), wide, and 1,7 meters, (5.5 ft), thick. 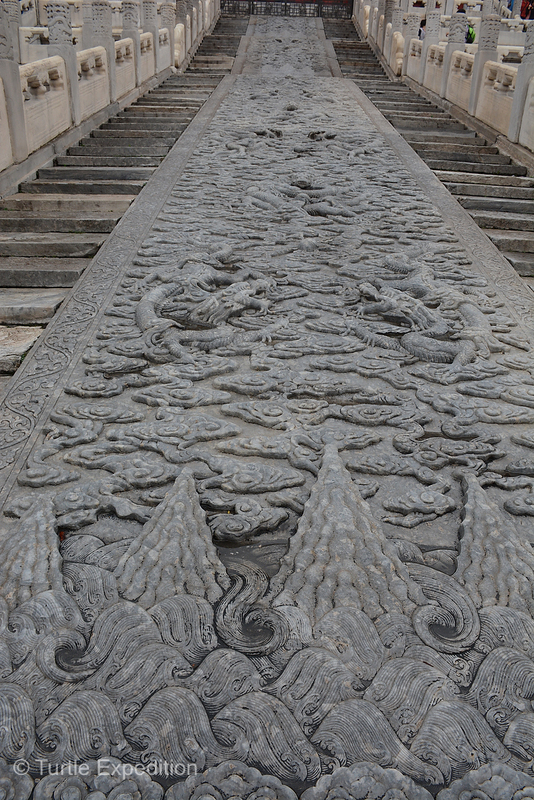 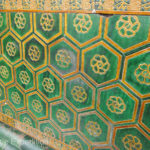 It has beautiful interlocking lotus patterns, curling waves and nine dragons. 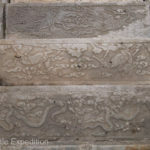 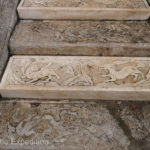 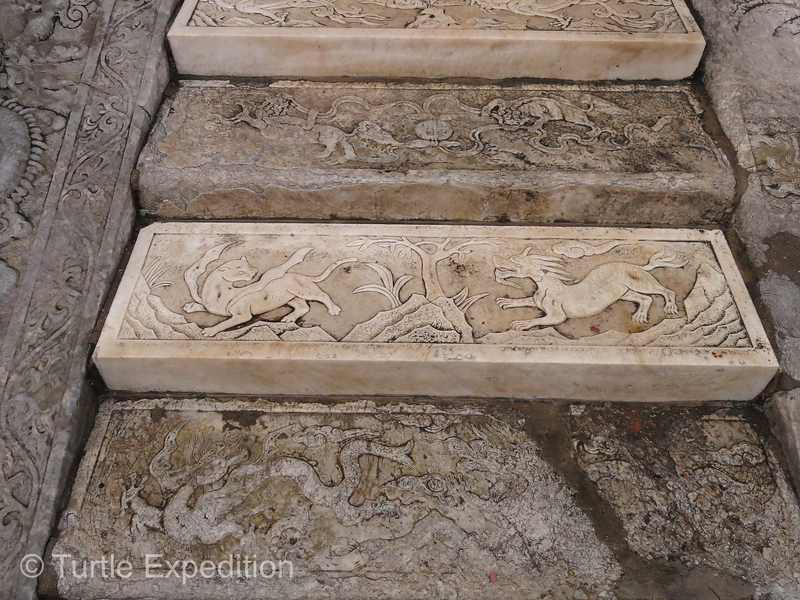 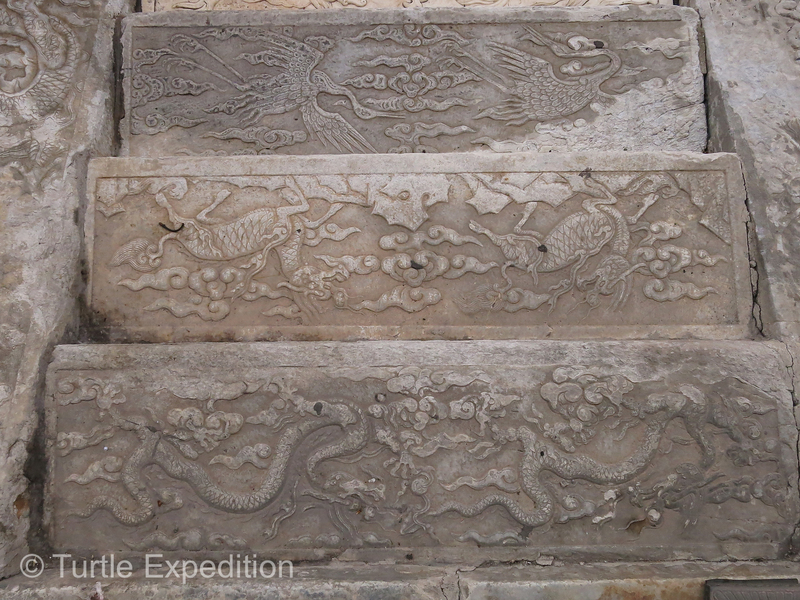 Intricately carved steps led up to the main palace. 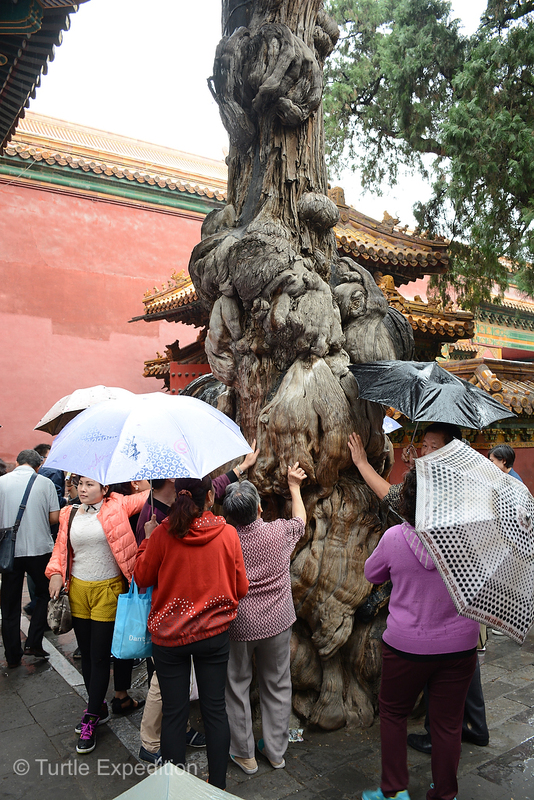 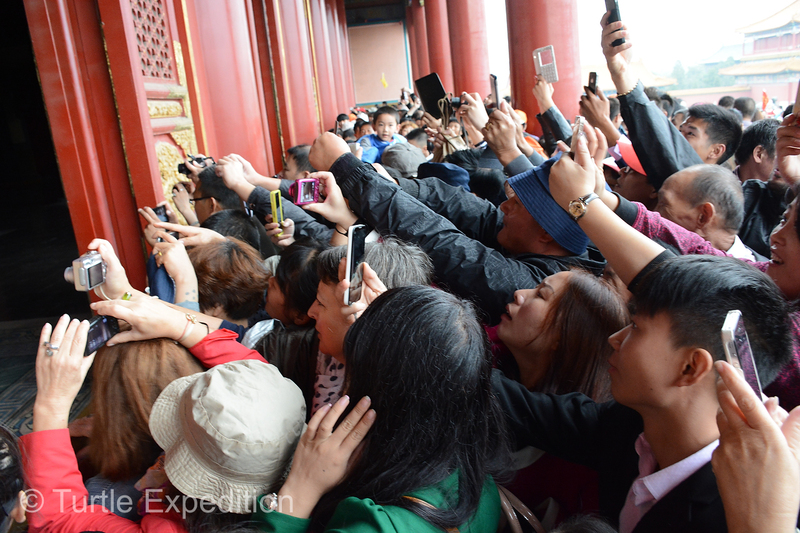 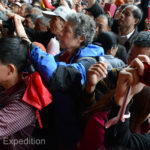 Tourists pushed to get a photo of the throne in the Hall of Central Harmony. 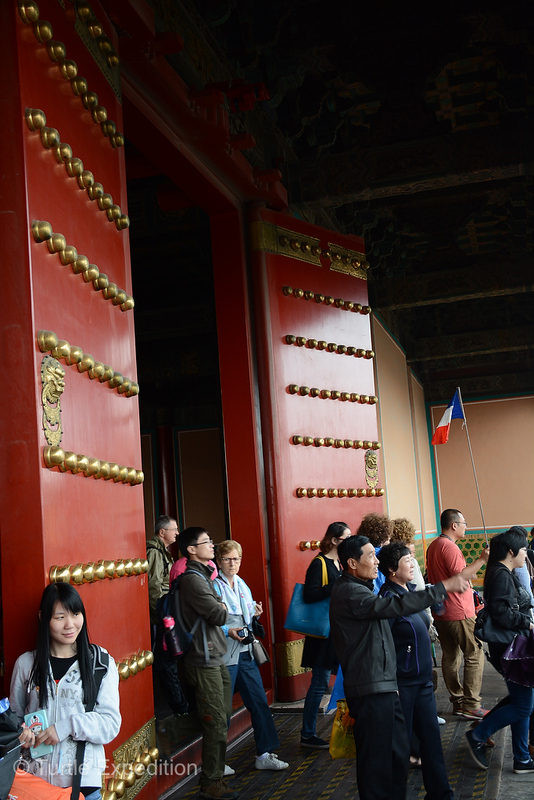 Even Monika joined the crowd with the advantage of being a little taller. 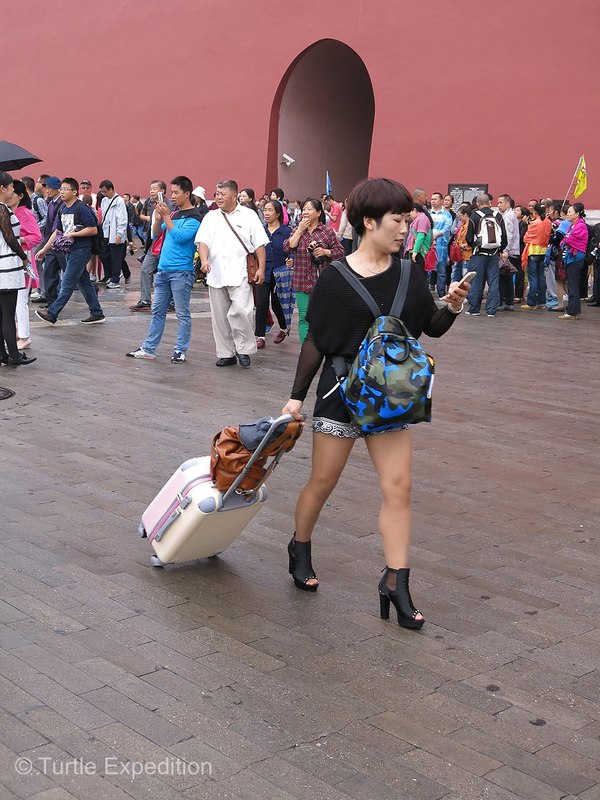 Even tourists need a rest stop. 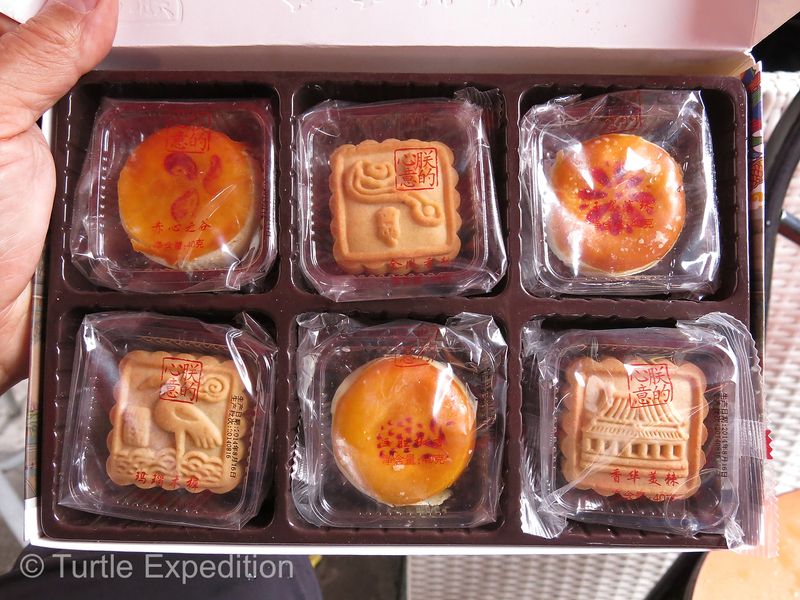 A group here enjoys a hot drink with some traditional “Royal Cakes” which are similar to “Moon Cakes” that we shared with Green during the Chinese Lunar Festival in the Gobi Desert. 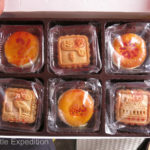 Falling on the 15th day of the 8th month according to the Chinese lunar calendar, the Mid-Autumn Festival is the second grandest festival in China after the Chinese New Year.